If your Where’s My Refund? Status Bars Have Disappeared PLEASE READ! One way to determine what is going on with your tax return is to go to the IRS website and request an Account Transcript. The IRS has made the “Get Transcript Tool” available for users to be able to instantly view their transcripts Online if one is available. You can also call and request a transcript at 800-829-1040, however, creating a login and viewing your transcript online in real time is the easiest and most accurate way to track progress. 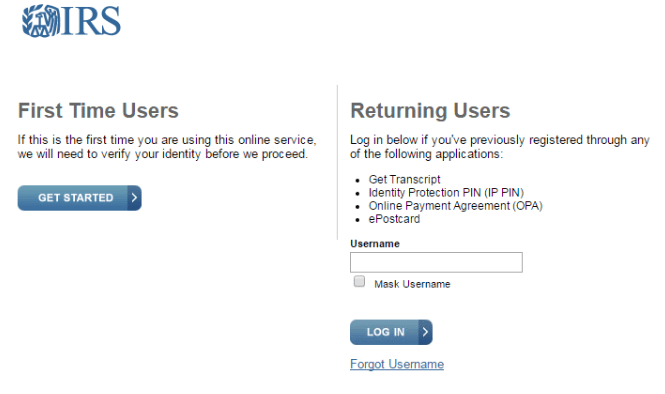 With an IRS online login, you can check the status on your account transcripts daily for updates. Ordering Tax Transcripts through the mail will not help you in any way. 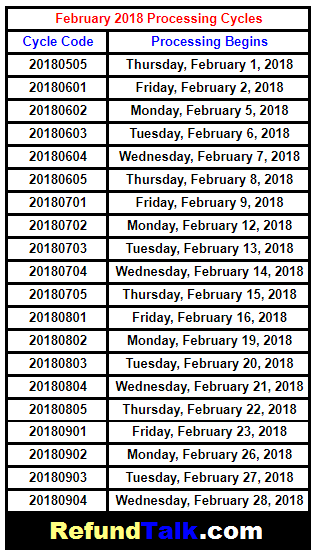 All ordering transcripts through the mail will do is waste paper that will end up hitting the wastebasket once you wait up to 2 weeks to receive them and realize the information is outdated. 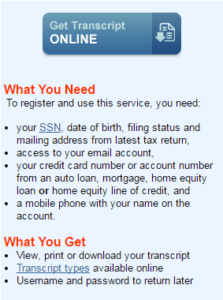 For the most updated and accurate information on your tax transcripts, you have to create an online account with IRS. Mailed tax transcripts are not good for checking updates. 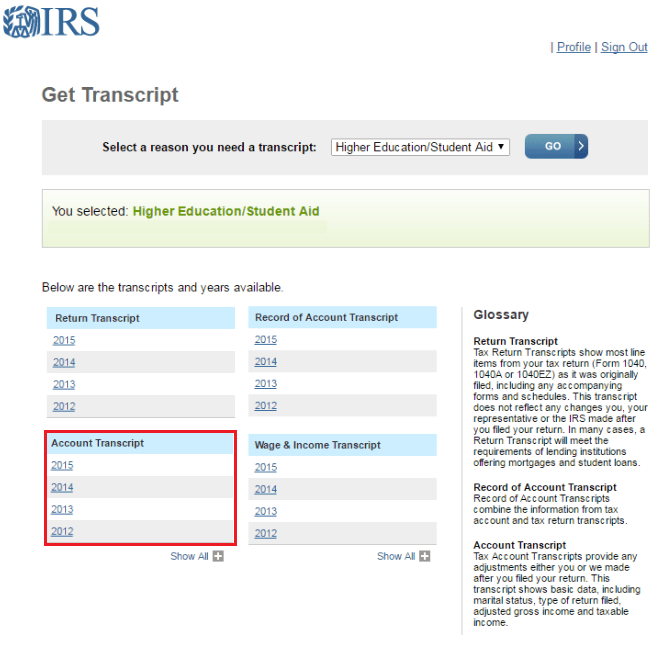 If your Transcripts are available for viewing through the IRS “Get Transcript Tool” you know the IRS has received your return and is processing it! Obtaining a copy of your IRS transcript is relatively easy, but understanding the codes listed on the transcript can prove more difficult. Here we will show you how you can use your Account Transcript to help you get a better understanding of what is going on with your tax account. Why would I want an Account Transcript? Here are some ways you can start implementing the use of your account transcripts. 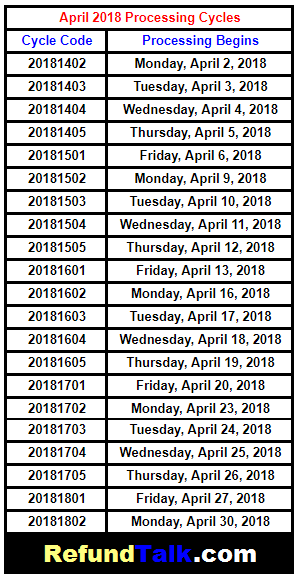 Waiting Longer Than 30 Days For an Update: The transactions codes that have occurred and posted to the account transcript can be pretty useful for someone who has been waiting for longer than 30 days and has not been able to figure out what is holding their tax return up. Track Letters & Notices: If the IRS is sending you a notice, the notice will show up as one of the line items on your account transcripts. Help Prevent Tax Return Fraud: One way you can help reduce tax return fraud is by being familiar with your transcripts. If a tax return has been filed with your information, it will show up on your account transcript as a line item. If you haven’t filed a return yet, this is a good indication that someone else has used your information for tax fraud. Checking your transcripts regularly could help prevent a fraudulent tax return from going any further by alerting the IRS as soon as you see the suspicious line item on the transcript. The damage done by the fraudulent claim will be significantly less if the refund money hasn’t been paid out yet. Taxpayers who fall victim to tax fraud have to wait longer to get their refunds— the typical identity theft case usually takes around 180 days to resolve. Some cases can take up to a year. These are just a few of the reason you should have a Secure Online Access to the IRS “Get Transcripts” tool and be following your account transcripts closely. 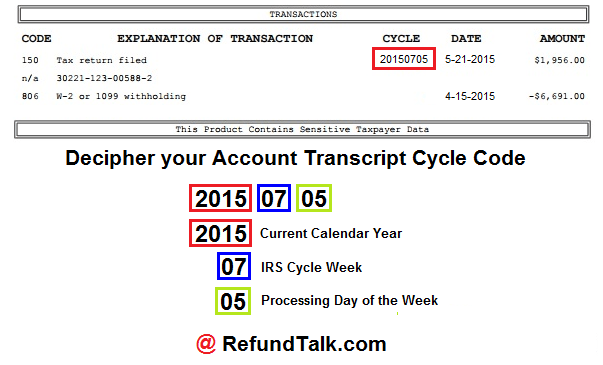 How do I obtain my tax account transcripts? Hold times can reach two hours. (Best to call first thing in the morning Eastern Time). Other than the wait time instant access. 2. Click Get Started under First Time Users. 3. Read the registration information and click Continue. 4. 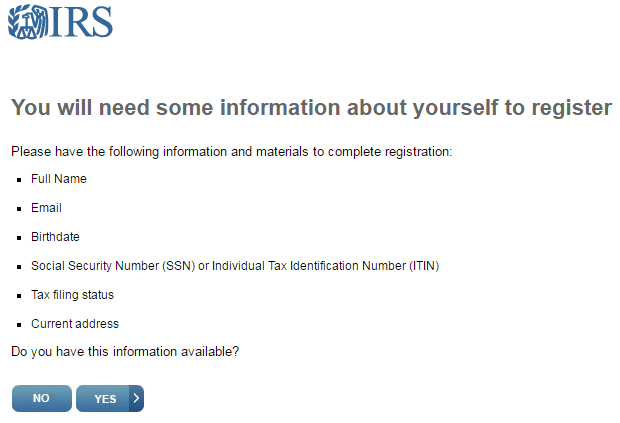 Confirm that you have the required personal information available and click Yes. 5. 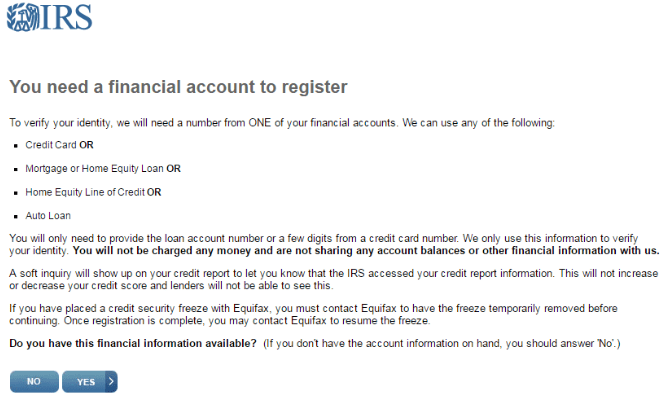 Confirm that you have the account number from a financial account listed on your credit report and click Yes. 6. 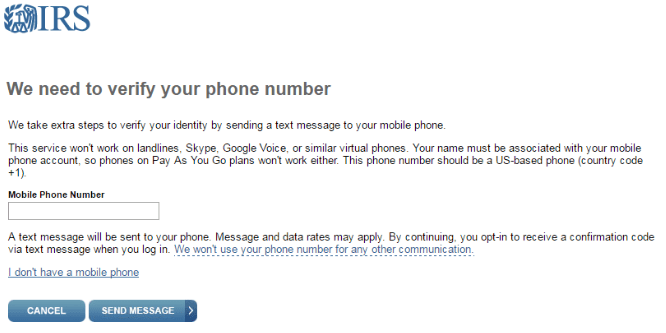 Confirm that you have a mobile phone number and click Yes. 7. Enter your First Name and Last Name as they appear on your most recent tax return. Then enter your e-mail address and click Send Code. 8. 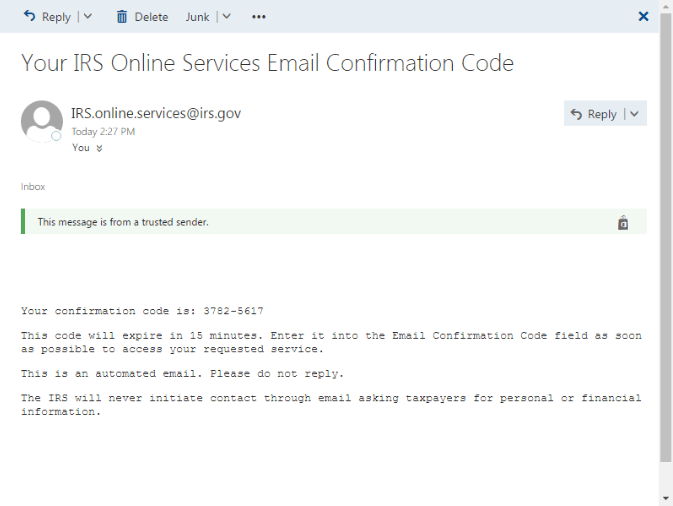 The IRS will e-mail you an 8 digit code. 9. 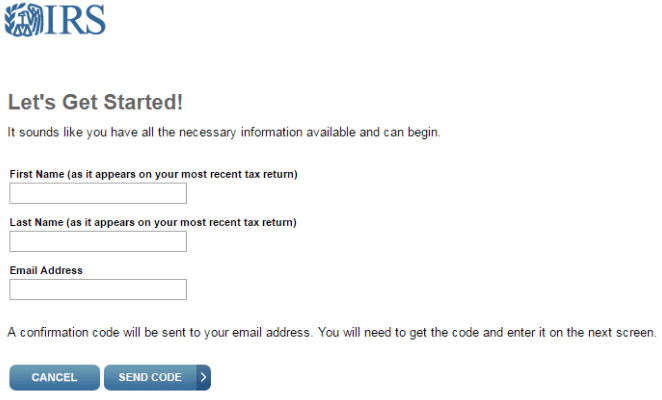 Enter your personal information and address information and click Continue. 10. 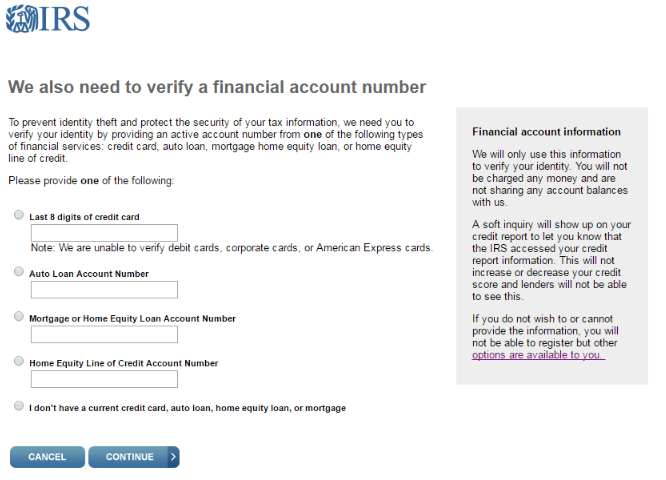 Enter the account number for one of the choices listed and click Continue. 11. 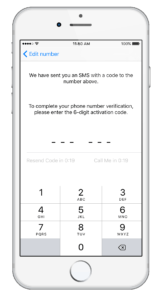 Enter your mobile phone number and click Send Message. 12. The IRS will text you a 6 digit code. Enter the code and click Continue. 13. 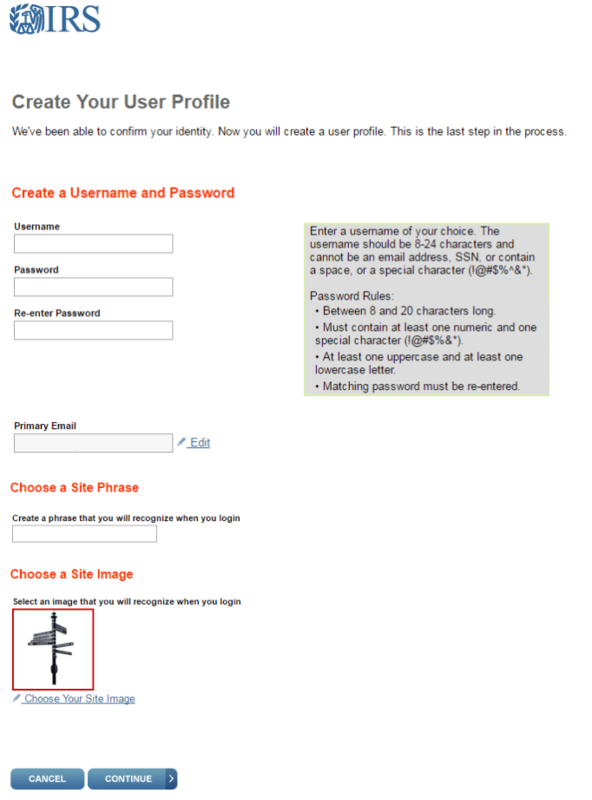 Create your User Profile by entering a username and password. Then enter a phrase and select an image that you will recognize. Then click Continue. 14. After your user profile is created click Continue. 15. Read the Security Announcement and click Continue. 17. In the Account Transcript box, click the year for the tax account transcript you want to download. 18. Congratulations! 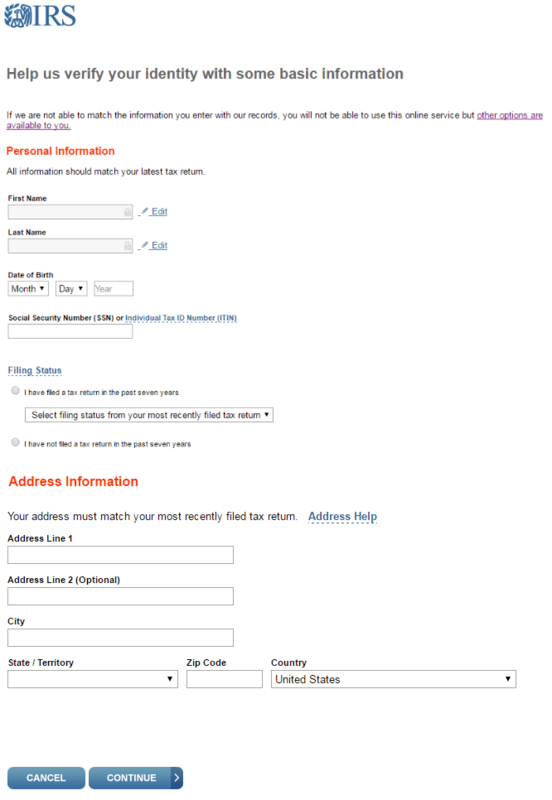 Your tax account transcript will appear in a new window. *In order for you to decipher your account transcript you will need to focus on the transactions area located on your Account Transcript. As highlighted in red above this Cycle #20150705 is the day your return posted to the IMF (Individual Master File) and began processing. What is the Cycle Code? A cycle code is an 8 digit code found on your account transcripts. 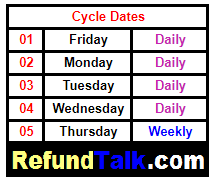 The cycle code indicates the day your account posted to the IRS Master File. 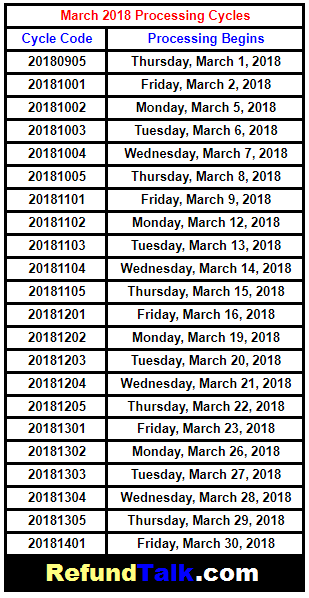 This date indicates the 4 digits of the current cycle year, two digit IRS cycle week, and two digit processing day of the week. We have simplified the IRS Processing Cycles from above to make them easier to read. 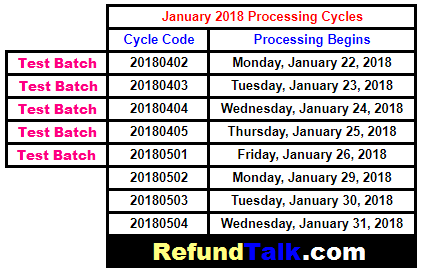 All you have to do is find your cycle code on your account transcript and use these charts below to determine the day the IRS began to process your tax return. 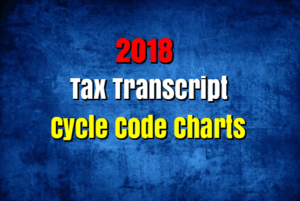 Find your Cycle Code on the charts and determine the day the IRS began processing your tax return. Trying to decipher your account transcripts? Use the IRS coding system to quickly determine which transaction codes belong to which family of codes. 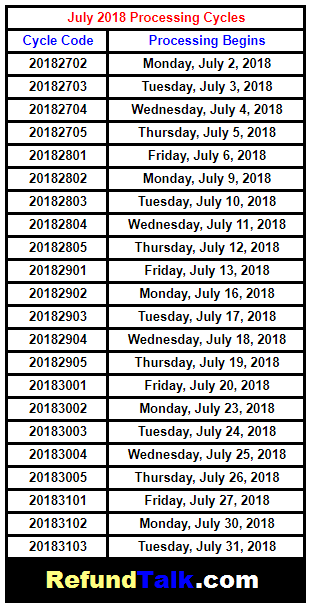 For example, if you are ordering your transcript because you believe the IRS neglected to send you the refund they owed you, then look for three-digit transaction codes beginning with 84X because this family of codes indicates a refund was issued. If you were assessed penalty for tax fraud or disallowed a credit due to fraud, search for codes beginning with 9XX because this family of code indicates an IRS criminal investigation. Similarly, codes beginning in 29X indicate a tax increase or decrease, codes beginning with 42X reference the initiation of an audit and codes beginning with 52X indicate a bankruptcy. 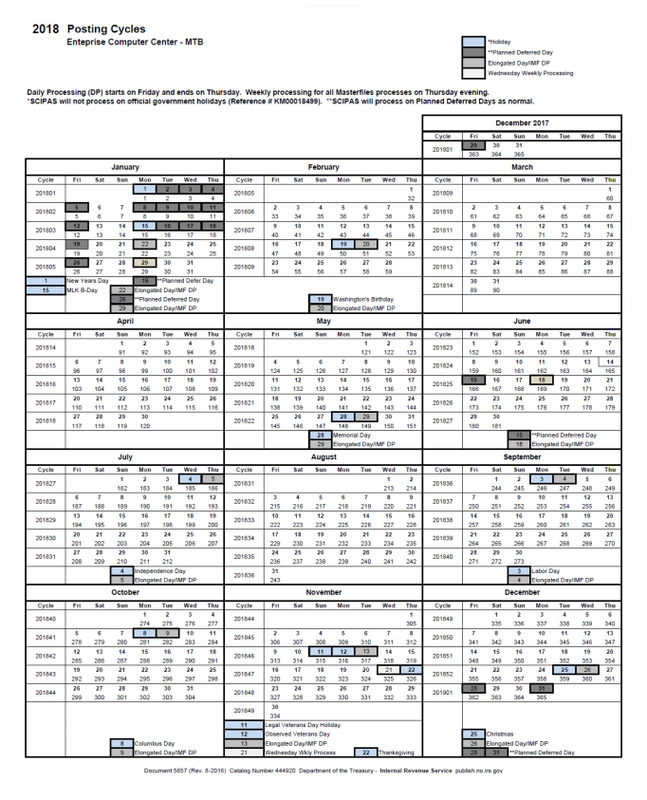 The system of family codes will help you understand your transcript, but some codes are stand-alone codes and are not included as part of that system. 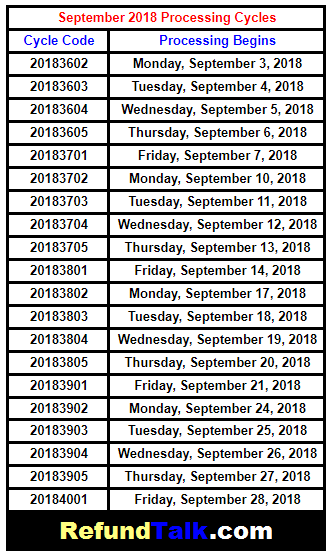 The following codes are the most common transaction codes that do not fall within the family of definitions previously outlined: A transaction code of 150 means a return was filed, 300 is tax assessed as the result of an audit, 320 is a fraud penalty, and transaction 460 is an approved extension of time to file. 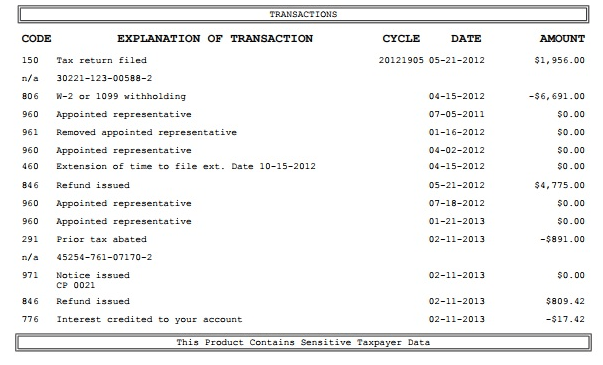 While the IRS is processing your return the Explanation of Transactions can change at any time. These transactions will keep you updated with what is going on with your tax account more accurately than the Where’s my Refund website or App. 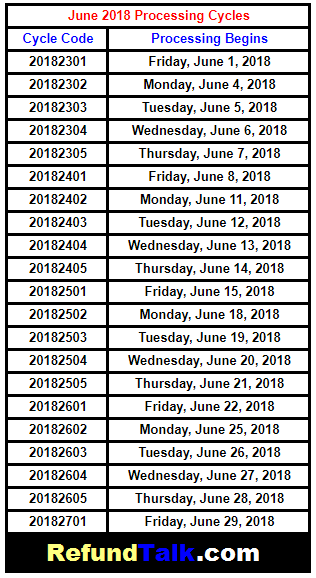 If you have certain codes that are hold or freezes you can view your transcript online daily for updates. If you have a hold or freeze on your account you will have to wait for a release code to post to the transaction list before you would see an 846 refund issued code. 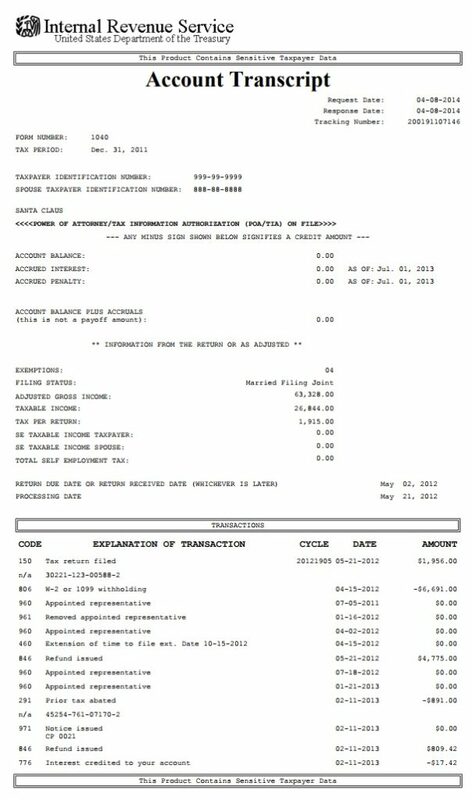 If you view your online or mailed transcripts and you see the 846 Refund Issued code under the Explanation of Transactions list. Your return is done processing and you should be receiving an update with a Direct Deposit or Paper Check date within 5-7 days. Code 768 Earned income credit Earned Income Credit Posts Earned Income Credit which is generated from information received from Code and Edit. Code 836 Refund you chose to apply for next year’s taxes. Payer Master File (PMF) “P”. Click Here For a Full List of IRS Transaction Codes! If you have any questions deciphering your account transcripts or want to help others on the tax refund hunt then comment below to tell us what codes you are deciphering while you wait for your tax refund.